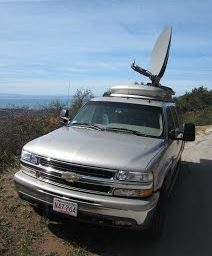 CBTV/Insert Studios: SNG satellite trucks in Santa Barbara and Boston. Rhode Island, June 2016: Chris Borghesani is the 'CB' of CBTV - a company he set up to offer camera crew facilities, SNG services and live broadcast studios in North America. He has more than 20 years' experience in broadcast and corporate production and has worked extensively with every major American broadcast network including NBC, ABC, CBS, CNN and PBS. CBTV/Insert Studios - which is new to promoting its facilities on TVZ - has three satellite KU uplink trucks covering North America from Boston to Los Angeles, and beyond from Canada to Mexico. In addition, for hire broadcast studios including Santa Barbara, Boston and Providence Rhode Island. Details of the CBTV/Insert Studio facilities.